BY MALIA ZIMMERMAN – State Representative Faye Hanohano, a Democrat from Puna who chairs the House Committee on Ocean, Marine Resources, & Hawaiian Affairs, has apologized for racial slurs she made to state exhibition experts from the State Foundation on Culture and the Arts as they hung artwork her office manager requested in her capitol office on Monday. 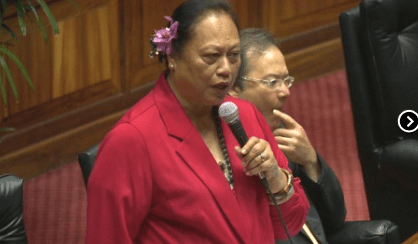 Hanohano, who is native Hawaiian and speaks Hawaiian as her first language, verbally attacked the state employees asking them why native Hawaiian artists had not been commissioned. She told them she did not want art produced by “Haoles, Japs or Pakes.” (Caucasians, Japanese and Chinese). The state Representative also threatened to cut funding to the the department for the “Art in Public Places” program, which places about 5,800 pieces of art per year produced by local artists in state owned buildings, including the state capitol. Eva Laird Smith, Executive Director of the State Foundation on Culture and the Arts, said her senior state exhibition expert documented the incident in a memo to her. “We are in Hawaii – a melting pot of ethnicities – and racial slurs should not be tolerated here, in the mainland or any where in the world for that matter,” Laird Smith said. Laird Smith met with House Speaker Joe Souki to tell him about Hanohano’s threats and racial slurs and asked Souki to obtain a verbal and written apology from Hanohano. Although Hanohano is the one who made the racial slurs and threats, she is putting her entire office staff through training with Equal Employment Opportunity Commission. Hanohano said she will also attempt to rebuild the relationship with the State Foundation for Culture and the Arts. “I stand firm in my position that individuals who serve in state leadership positions should be thoroughly educated and informed on the history and native culture of Hawaii. I am hopeful that this unfortunate incident can serve as a platform for improving dialogue and cross-cultural relationships between state departments,” Hanohano said. Michael W. Perry, who is a co-host of Hawaii’s most popular radio morning show, the Perry & Price Show, said on the air this morning that Hanohano’s apology sounded more like a “non-apology” coming from someone who did not really want to apologize. He joked that if he or his co-host Larry Price had said anything like that on the air they would be working at K-Mart doing announcements for shoppers, and not on the radio. Callers to the Perry & Price Show were also outraged by Hanohano’s comments. One caller, who lived in Puna, said she hopes the voters in Hanohano’s district remember her comments during the next election. Laird Smith said she is satisfied with Hanohano’s apology and her staff offered to remove the artwork and replace it with artwork from native Hawaiian artists as Hanohano requested. But for now the artwork, which matched pieces already hanging in the office, remains there. So why hasn't CNN pick up this story? Oh yeah, she's a Democrat. Racism is racism, no matter which way it is flowing! Communist News Network ? > Puuulease, stop. When a CNN anchorperson falls in the forest, does anyone really hear, or care? Grew up in Kailua. Would have immediately pegged her as a Waimanalo Moke. This is what happens when the mokes are in charge. A moke — that's right on target. Sucking up the US government tax dollars while castigating the government. So typical of the Native Hawaiian Scam. Hanohano's racial outburst is NOT Reated to Displaced or Wrong issue to what the Hawaiians endurfed. rom . If she knew of basic history, it's the underlying unconscious bias/problem of ethical relativism . Hawaiian culure had conflicts among other Hawaiians, from the book;"The Betrayal of Liliuokalani, last queen of Hawaii," by Allen, Helena (1982). Arthur H. Clark publishing, l1c. I agree and THANKS for your excellent comment. This matter should not be allowed to die on the vine. She's a bigot, obviously, but it is worth looking into the horrible history of American mistreatment of the Hawaiians and the colonization of the islands. More than a decade ago I was on a TWA flight. The flight attendant told me that she was native Hawaiian and the rightful descendent to the throne. (Or so I remember.) Doesn't anyone know who this woman might have been? She might have been delusional.